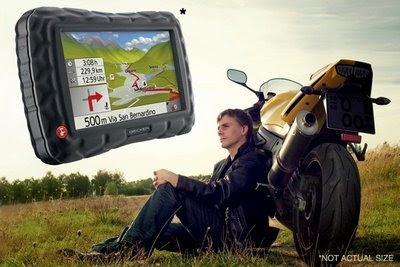 In an apparent attempt to compete with Garmin's Zumo line of motorcycle-friendly GPS units, a company called Becker has introduced its Crocodile unit. Details are paramount in a tech device, and the photo of the Yamaha R-6 in Becker's ad doesn't inspire much confidence. (Look closely). Maybe the Crocodile is for right-hand drive British bikes only? And why does the rider appear so calm while he's holding that motorcycle up with his back, which also must be burning? I am grateful, however, that Becker included that disclaimer...I was struggling under the belief that the GPS unit was larger than the bike itself.